We got to know each other via the district board in 2004 and it soon became obvious that our thoughts were on the same frequency regarding pigeon racing. 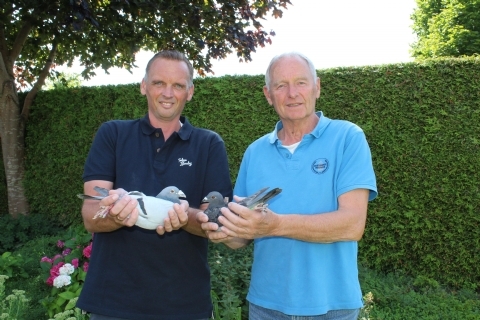 A life without pigeon racing is too hard to imagine for both of us, it is a lot more than a hobby, more like a sport, it is a passion! From this mutual feeling and averse to all the doomsayers and negative opinions within our sport, we see nothing but opportunities to continue practicing our beloved sport. Friendship, fun, and collaboration are key words for us. Dream differently, think differently, do otherwise. Change starts with yourself, even in the pigeon. 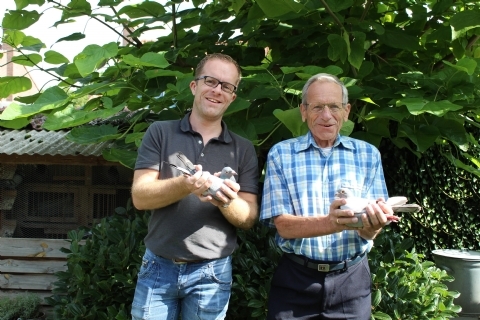 Gijs has been actively racing pigeons since the early sixties of the last century. As a young child, Wilfred was impressed with pigeons and has been totally involved in the daily chores in and around the loft since 1989. Since 1990 they formed a partnership that races alias G. Hamstra & Son. Anno 1999 we switched over to the marathon races using the natural system. Our finest moment in this discipline of the sport had to be winning the National Loft Championship Marathon in 2013. Although we still love to participate in the afternoon liberations, our heartbeat increases at the prospect of a marathon race with a morning liberation. We try to keep the pigeon racing hobby as simple as we possibly can. That means that all the racing birds are housed in lofts with straw on the floor and the stock birds on grills. In the young bird loft the droppings are never cleaned out and the old birds can eat as much as they like during the racing season. The youngsters are well trained in their year of birth and if possible up to about a distance of 400 kilometres. Since the end of 2013, we became members of one of our strongest clubs in the North-West region of the Federation 8 G.O.U, namely a club called P.V. de Eendracht in Harderwijk. “Eendracht maakt ons sterk”, in English it means ‘Unity makes us strong’, is the motto of this club. Something that we should pursue at a National level within the sport and maybe even on the worldwide stage. Our motto within this fantastic hobby is; breeding, racing and selecting. Attempting to acquire good material to breed youngsters from and from the moment that a youngster first sees daylight, a process of selection. The ultimate goal is to breed pigeons capable of winning regardless of the discipline, race distance, location or weather conditions. Peter begun at a young age with pigeon in the town of Bunschoten, where he became infected with the ‘pigeon virus’ at the age of twelve years old. Cleaning out the drinking pots was the first chore in the loft. In the meantime, we participate in racing alias the name P. ter Beek and Son from our residence in Biddinghuizen. That is situated in the extreme west corner of the Flevo polder in Federation 8 G.O.U., region NW, district 3. A conscious choice, in an unfavourable location compared to their rivals. The focus is on the long distance day races and the marathon races. Sprint and middle-distance races are only used to get the birds in the necessary rhythm. In the birth year of our youngsters, they are trained as much as possible to a maximum distance of about 430 km. The standard is high, because the amount of space in the racing loft is limited. The focus is more on quality and not quantity! We believe in overview and attention and after years of experience we remain realistic, because winners, real winners are very scarce. Rather have a closed nest box than overcrowding. Since 2016 we have races the birds in the disciplines described above purely on the natural system, which has been much to our liking. We believe that keeping pigeons close to nature and racing them on the natural system is more compliant to our vision. The birds are calmer, more relaxed and easily motivated on their nest and by… jealousy!